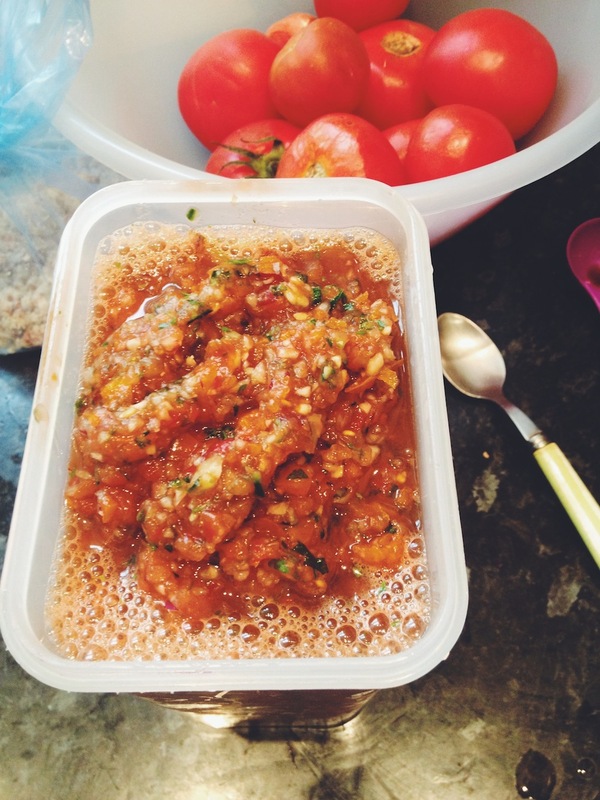 I cannot believe that i’ve kept this recipe from you lovely folks for so long. I was so sure that i must have shared this since its on rotation pretty regularly round our way. Still, no time like the present eh? 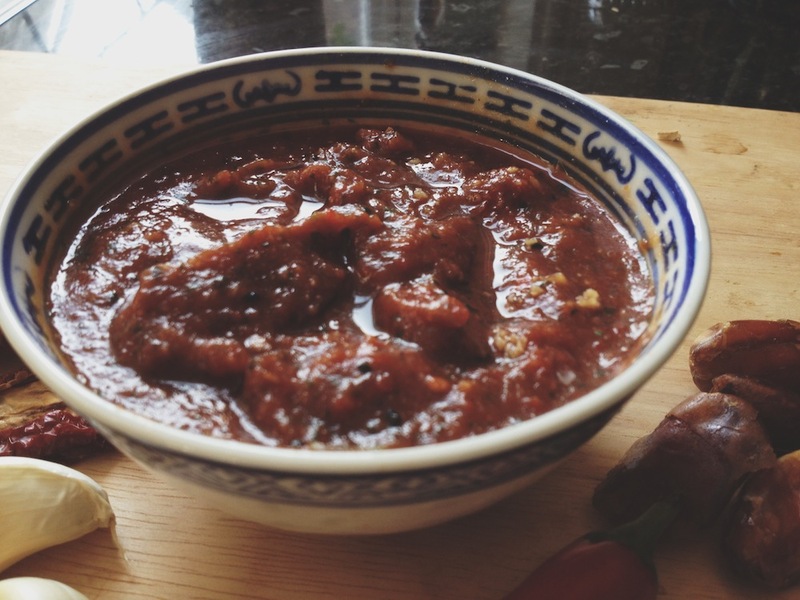 Sweet chilli sauce has always been one of my (many) Achilles’ heels (i must have about 7 legs by now). One bottle was never enough for me. As in, i’d easily go through 1/2 a bottle at any given meal. I’m pretty sure i used to make “dipping” food just so i could get my hands on that sweet, sticky addictive goo. Obviously now i’m (slightly) older and (mildly) wiser i know that there was probably heaps of MSG and sugar in my naughty little friend. So creating my own, healthy, nutritious one was certainly one of the first recipes i invented when i jumped to greener pastures. I guess thats why i assumed i had shared my secret weapon with ya’ll before. Its just so easy to make, totally hits the spot and is so utterly delicious that i suppose i take it for granted now. Oh that ‘ol thing, i just threw it together kinda attitude. 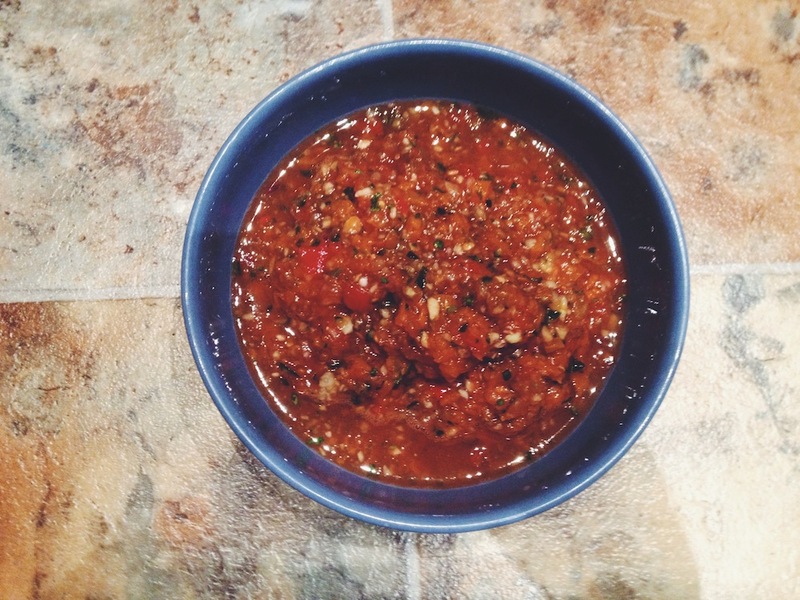 This beauty goes with everything that plain old store bought sauce will go with. Its versatile, punchy and still retains that more-ish addictive quality that got me hooked all those years ago. 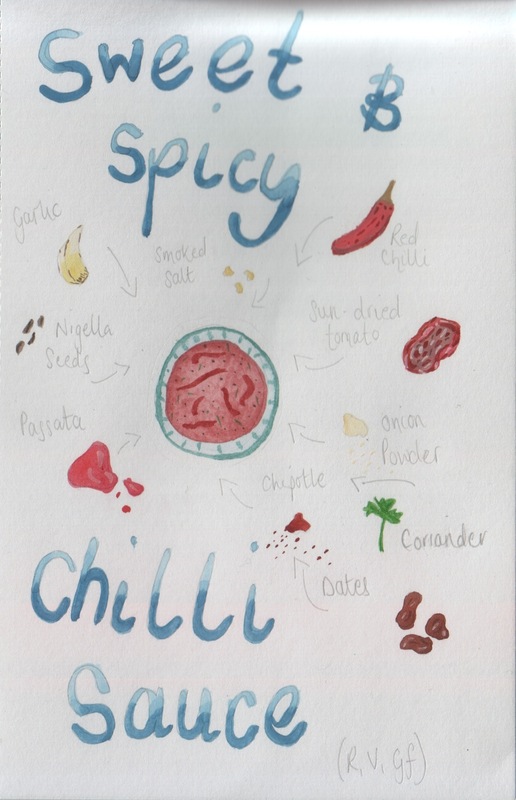 I like super hot heat when it comes to my spicy meter but you can totally reduce the amount of fresh chilli and swap the chipotle for smoked paprika to appease more sensitive tastebuds. Aside from its on point flavour, this baby is raw so you’re actually giving your bodies a hefty hit of nutritional goodness. Making it the perfect, healthy addition to loads of cooked and traditionally not- so healthy dishes (and yes, i mean you mr chip). I believe in the inherent fantasticness of the comos- that everything happened and happens exactly when and how its meant to. This thinking can at times be a bitter pill to swallow, but faith compels me forward. And right now, you know i am sitting here, thanking the universe for its unspeakable brilliance. Thanking it for unravelling itself as it has, for giving me the greatest gift i could ever hope to wish for. For slowly manifesting itself into my very idea of happiness. Yes, life is hard and it takes a good deal of effort and work to get things even ticking along, but the universe is kind and omnipotent and can see things further and wilder than i can even imagine. I am sitting here today with so much love in my heart. And hope- the single most important thing (in my mind) that we can possess and nurture, and i am full of it. I guess today i am blessed with the providence to see, or get a hint at the magic thats really going on out there. And simultaneously, i am blessed with the (rare) chance to really appreciate who i am and what i’ve accomplished thus far. I beat myself up in so many (not relevant for here) ways that i never take stock and thank myself (and the world and all my glorious loved ones) for everything that is. Here and now. So yes. It was a conversation, about a month or so ago, where i just knew, in my gut and heart, that the world was conspiring to provide exactly what we dreamed and wished and long so hard for. And last night, on my way home, it sunk in. And so i wanted to share this (mysterious) and incredible experience with you. I guess, in case on the off chance, you’re needing reassurance about this crazy old life. Have faith, be strong and wait it out. If you want something enough, its just around the corner. Keeping working and dreaming and believing- miracles do happen. 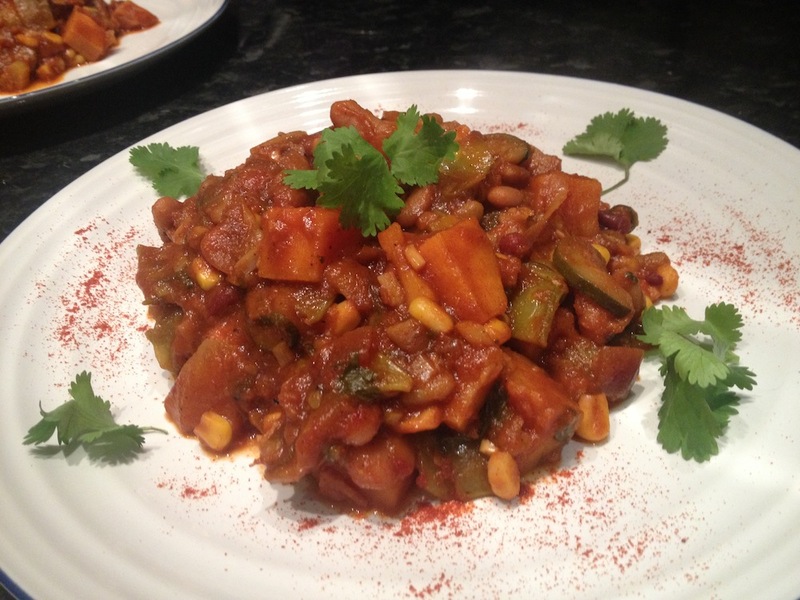 In the meantime, cook yourself a big ‘ol pot of these smokey roots and beans. Breathe it in, nourish yourself and maybe even thank yourself, you know, for sticking at it and being you. The other day was one of those where the fridge had amassed far too many odds and ends of vegetables. I love those days, but sometimes i long for simplicity. I question whether my cooking would benefit from a pinch of minimalism. I wonder wether you lovely folk would prefer if things were more paired down, cleaner. I’m sure i could walk that line. I could attempt a sleeker recipe. I could settle on even one flavour and go from there. But even writing this makes me uneasy. I can feel the epic tin of spices shaking its head from the kitchen. See for me, cooking is like painting, is like witchcraft, is like dancing. Its pure intuition, gut feeling and relentless curiosity. I don’t think i would be staying very true to my nature if i actively changed the way i create food. But then, experimentation and challenge are the greatest steps forward a person can take. So maybe i will one day dip my toes into those new waters, but for now i think i’ll hang out in my usual spot- under a tree, in the forest. With all this rambling in mind i will say two things that largely underpin my philosophy in life. 1: the world is lacking in magic, i want/ encourage/ actively seek the energy of anything bubbling with magic. 2: my favourite colour is all the colours, you know, like rainbow glitter. These two thoughts guide me in few placer stronger than my cuisine. I love the continual journey of taste- learning and following flavours to where ever they lead me. Understanding the properties of each flavours profile, getting to know what aspects work with others, what can be paired and what needs to be used with caution. Cultural cuisine is therefore perfect in this respect. I spend a lot of time (probably more than i’d care to detail) learning about the dishes and flavours of other cultures. Finding out what plants, spices, herbs are fundamental and using this knowledge to inform my practice/ experiments in my own kitchen. Although i know i will probably never come close to authentic in terms of overall preparation/ taste, i feel my confidence continually growing and my knowledge increasing with every step. And from this knowledge, a whole world of fun arises- fun that usually involves throwing this and that into the cauldron that is my cooking pot. The results are part of the journey, sometimes they work, sometimes they don’t, but the learning part just makes it all the more worth it. And so we come to the curry and in fact, full circle in this diatribe. 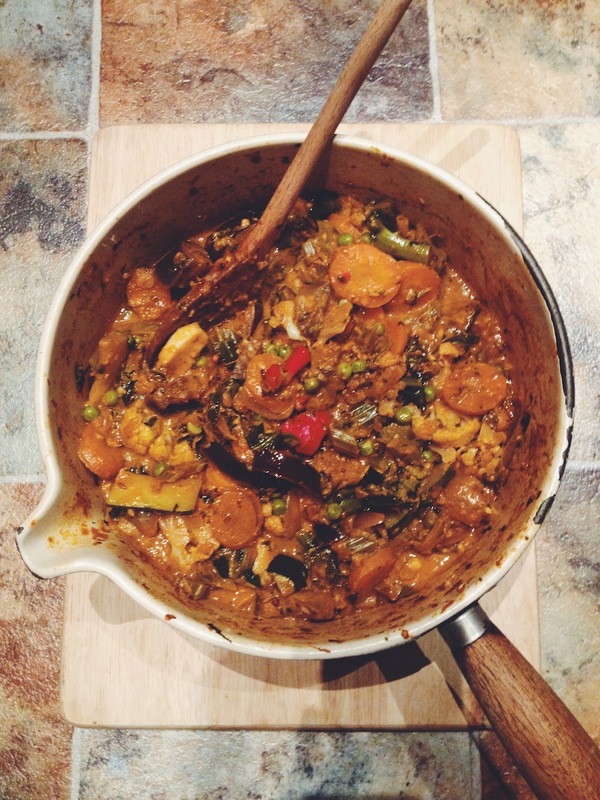 Curry/ stew/ soup- they’re all groovy for using up the waifs and strays that linger about in the back of our fridges. 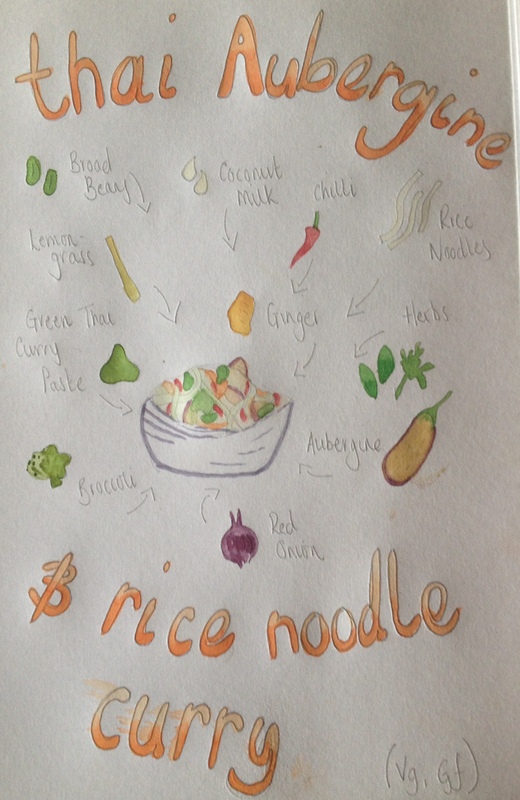 And Red Curry- Kaeng Phet, well thats just a swell hot, sour and creamy feast of flavours right there. Big pan, a couple o’ cabbage leaves, two forks and some pretty impressive appetites. Good night ladies, ladies goodnight. But really, i can’t stop there can i? What with all this blank white inter- space and all those awesome flavours, nah… The secret (if its even a secret at all) is balance. Yes each ingredient boasts a robust flavour, but when carefully proportioned they all work so well together. Each working as a cog for a particularly beautiful grandfather clock (if you will). The main differences lying in the use of red chilli and paprika. Lots of both, if thats how you roll- but pleasantly tempered with fresh notes from the ginger and lemongrass. The garlic and coconut mellow things out into a dreamy, heady pungency. And yes, go to town with the old veg you’ve got kicking around, just remember to throw them into the pot accordingly (i.e. get the thicker/ longer to cook veggies in at the start and work from there, green, leafy folk and the delicates in towards the end). When 5 minutes is left, stir in the peas and spinach. Now ya’ll probably well versed in the ways of gazpacho, but me, well, i ain’t ever really rocked the raw soup that is the centre of this post. I’ve eaten it but its never really struck a chord (you know, one of those deep, melodic chords, that resonate in your chest)?! Its probably that ol’ me-not-liking-soup thing thats held me back but could i really boast a RAWsome arsenal without this flavour bomb under my wing? heck no! So here is Green & Leithy’s Gazpacho. Packed with unadulterated goodness, flavours and heat. 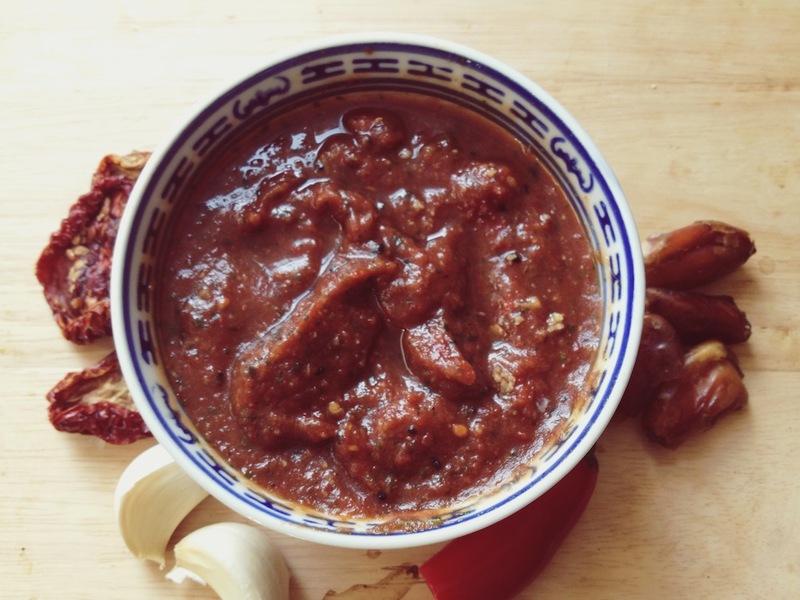 Oh yes, the heat… A wonderful melody of dried red chilli and smoky chipotle. 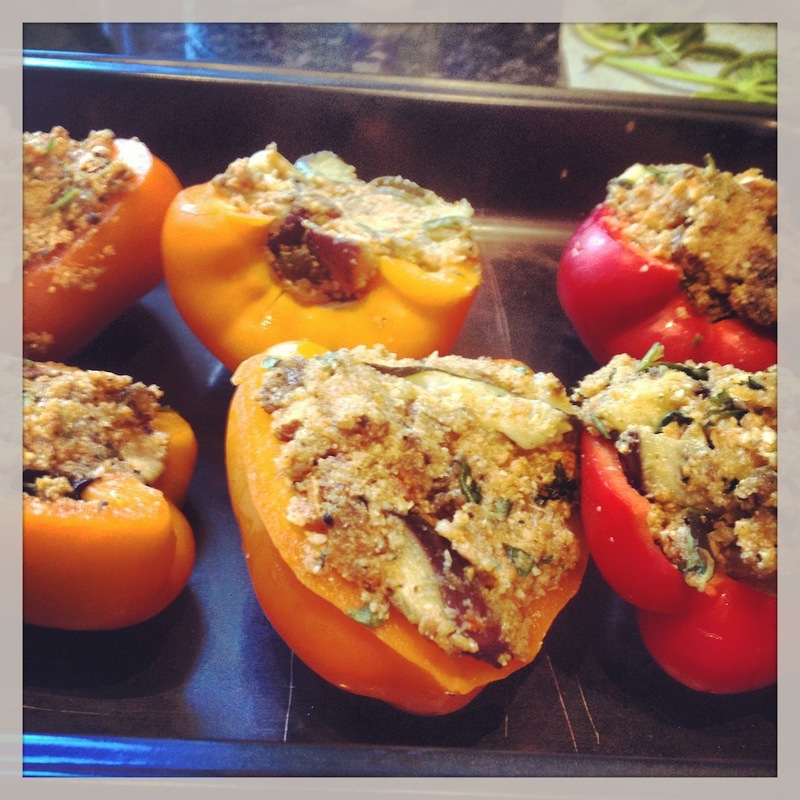 Theres all the usual suspects of veg going on underneath the beautiful flavours. Eating this really got me thinking- why don’t i make this more often? 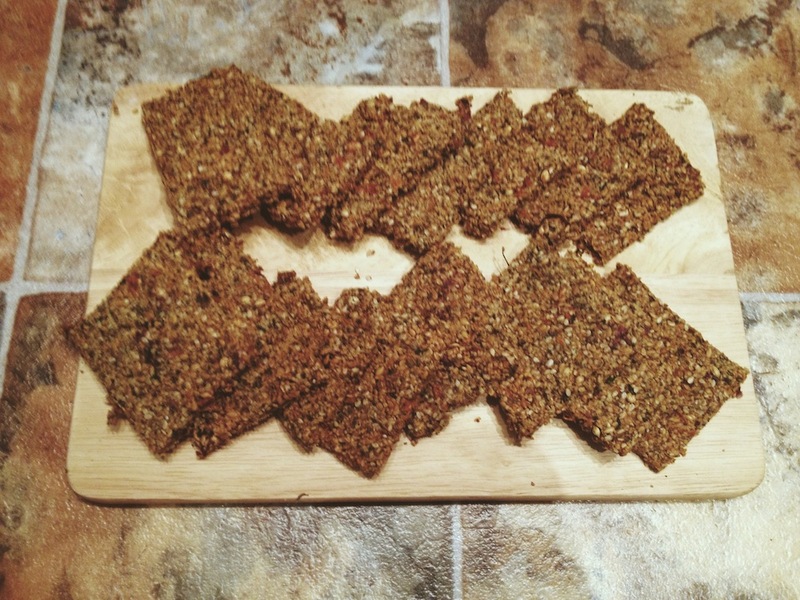 The crackers are another beast entirely, and you absolutely could cook them in the oven. They are rich, sweet, and morishly balanced. Extremely versatile, these guys would be awesome with cashew cheese, hummus, falafel, oh the list goes on. Problem is; they were so good we ate them all before we could really test their potential. That equals a massive culinary win in my book. 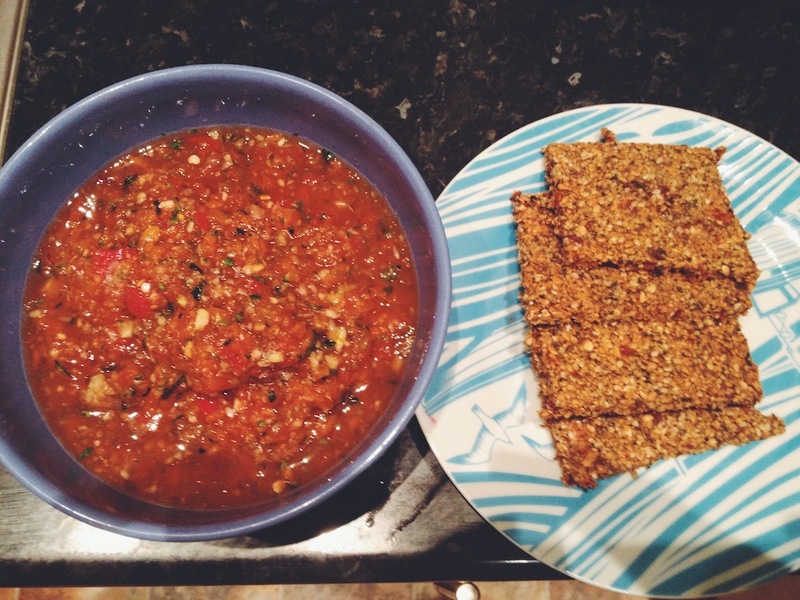 These crackers compliment the gazpacho beautifully. 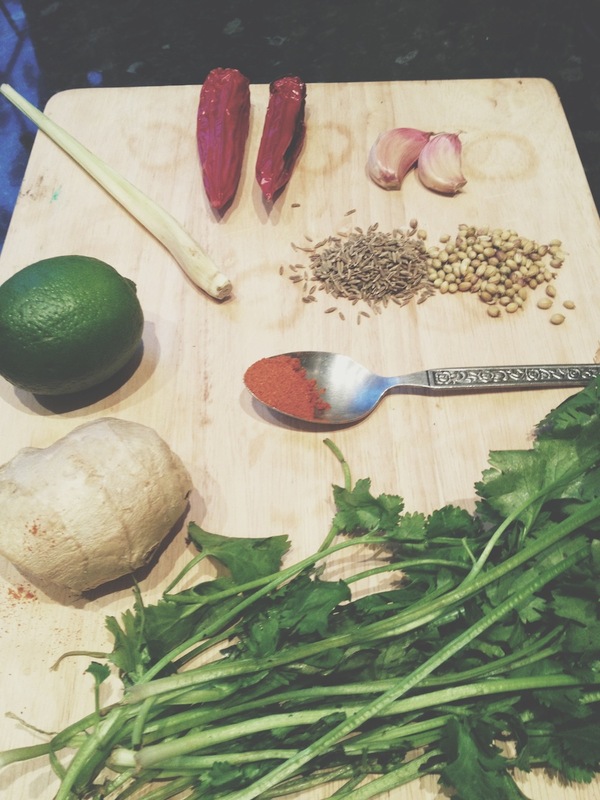 An unctous undertone for the fresh and zesty soup. Combined the meal is both refreshing and satiating. And easy as heck to prepare- woop! 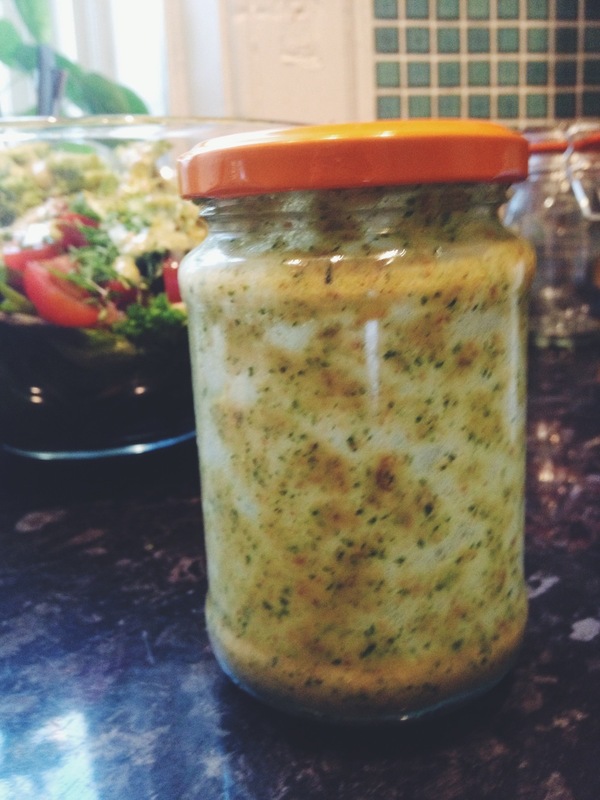 Heres a quick, fresh and exciting (yes exciting) dressing for all your culinary goodness. It takes about 3 minutes to whip up which means its perfecto for livening up salads, grains, steamed or roasted vegetables. Its tangy yet sweet and keeps for about a week, so its an excellent little guy to have on hand when inspiration/ time is low and hunger is high. I used (my new!!) spice grinder to whizz this baby up but you can totally create it in a pestle and mortar. Hello world. Hello sun. Hello heat, warm gentle breezes and long days of glorious sunlight. 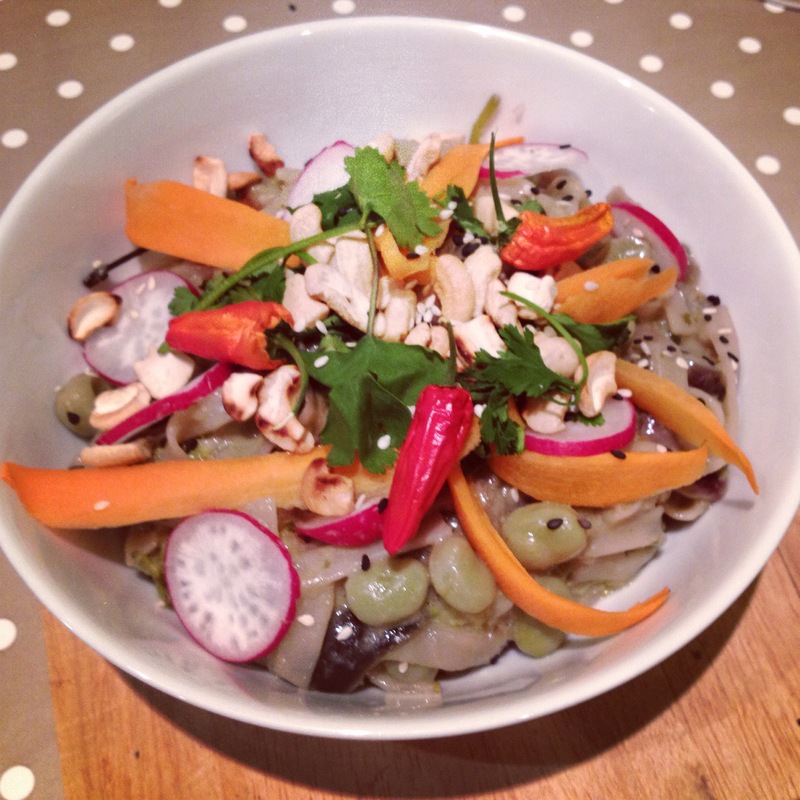 Summers certainly here and to celebrate we at Green & Leithy went RAW for the week. I enjoyed it so much that i have this niggling feeling i may venture into RAW pastures for the foreseeable future. Celebrating nature in its purest, edible form- the bountiful array of textures, colours and flavours. I adored the opportunity to become even more experimental in the kitchen; pushing the boundaries of each ingredient’s potential. We ended the week with a cooked meal and i was actually a little regretful- there was just something lacking. I guess my teeth had pretty firmly taken a bite from the RAW tree and let me tell you, it tasted awesome. Being the diligent culinary student i am, i’d done a fair amount of research into raw food preparation. 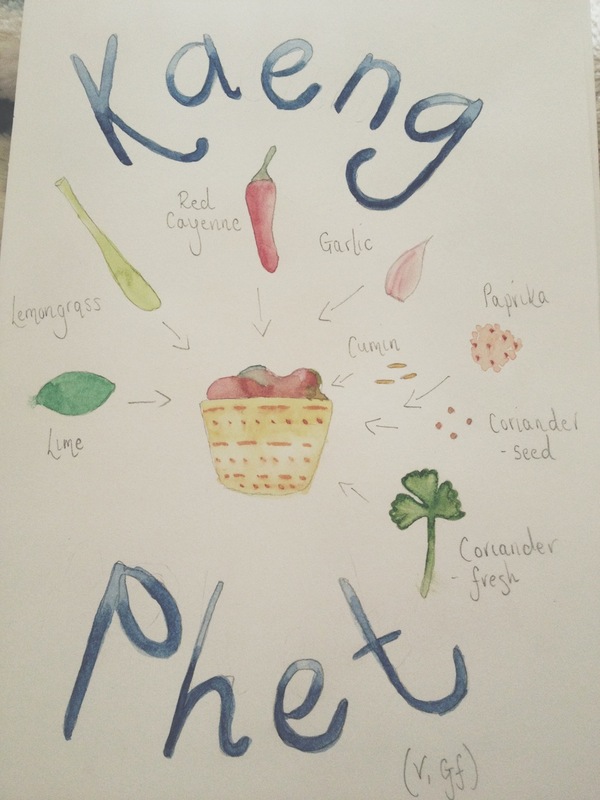 Yes, there is a bit of forward planning needed- soaking, sprouting, fermenting etc needed, but these are all skills you’ll get to grips with quickly and hey! who doesn’t like learning?! Once mastered, there seems to be few limitation to your rawsome cooking potential. In terms of “cooking” time- meals take a heck of a lot less time to create, so to my mind, its totally worth it. My favourite raw inspiration, you can find here. What i have found however, is that there seems to be a lack of raw savoury recipes. Don’t get me wrong, theres plenty of delicious and exciting ideas out there but they generally fall on the sweeter side of the scales. So my next challenge is to set about plugging this gap. You have been warned- things are going to get experimental round here. 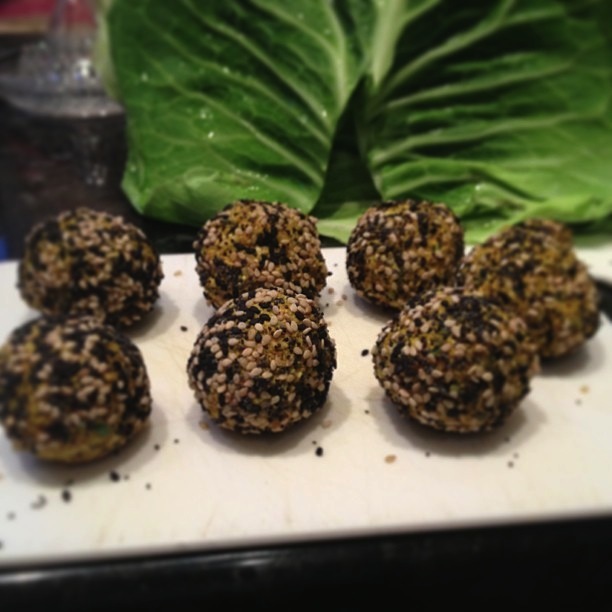 The following recipe (yes, i’m finally getting to it) is a simple reworking of my favourite food- the fabulous falafel. Sprouted, creamy chickpeas cosy up to baby spinach leaves on an earthy bed of Mediterranean spices, this heavenly mix is then gently wrapped in an assortment of crunchy, nutty sesame seeds. Served with simple Sweetheart cabbage leaves (i.e. the best wraps nature ever did make) and a good dose of raw hot sauce. Bliss, nourishing, clean bliss. Part two of Cauliflower appreciation society. Once blended, the cauliflower closely resembles rice, which is what lead me to stuff a couple of juicy peppers with it. Spiced with this Moroccan spice blend and combined with some crunchy almonds, sweet sultanas and fresh coriander- the results were fragrant, blissfully tasty and completely satisfying. So no more concerns about substituting grains, legumes or rice: the cauliflower is my new secret weapon. Falafel? Again you cry? Yes, why the heck not? These little cuties are bright red/ pink, flavoursome and extremely good for you. Beetroot contains potassium, magnesium, iron, vitamins A, B6 and C, folic acid, carbohydrates, protein, anti- oxidants and soluble fibre. 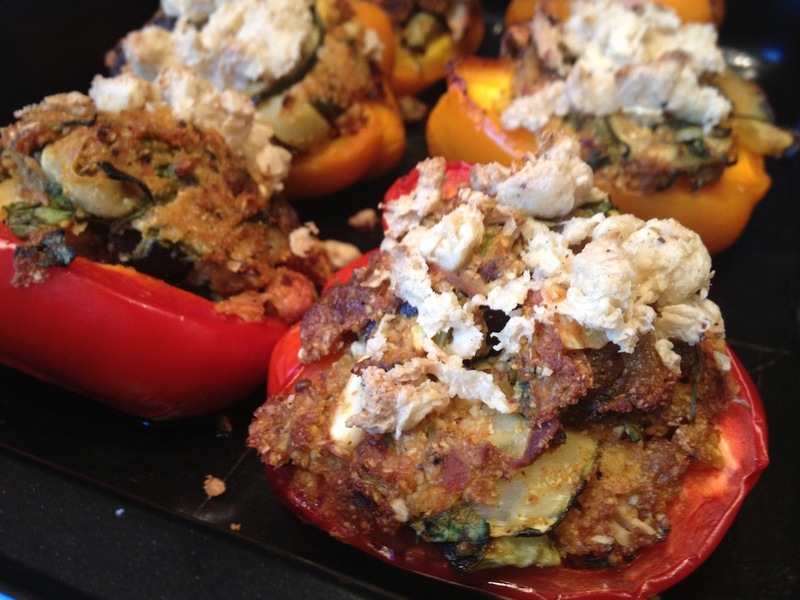 As with all my falafel recipes, these are baked so theres no evil fats going down. Just pure good, lentilly nutrition. 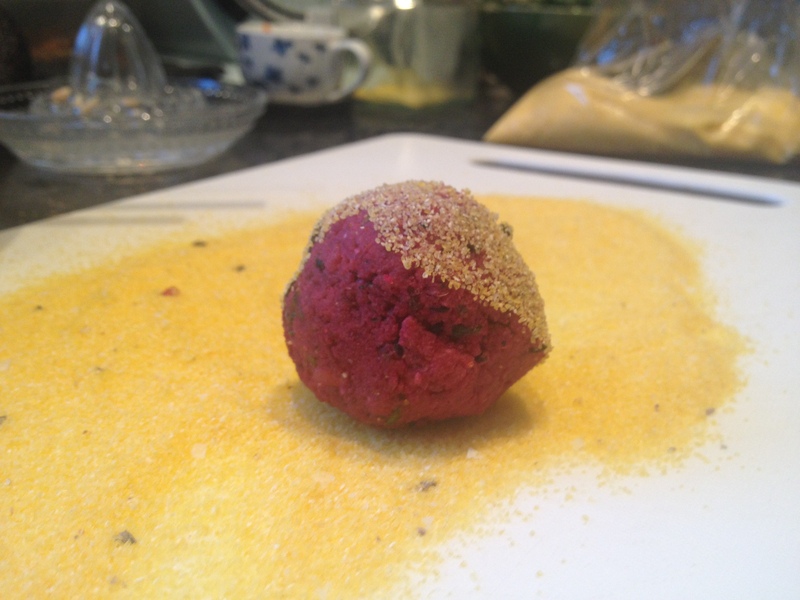 The sweetness of the beetroot is amplified by the addition of Nigella seeds and Cumin. The seasoned Polenta coat that lightly holds these soft sweet ovals adds another dimension to the texture. The first bite is crisp, the second is soft, fragrant and heady. Although the finished colour is groovy shades of scarlet, the bulk of the ingredients are yellow. 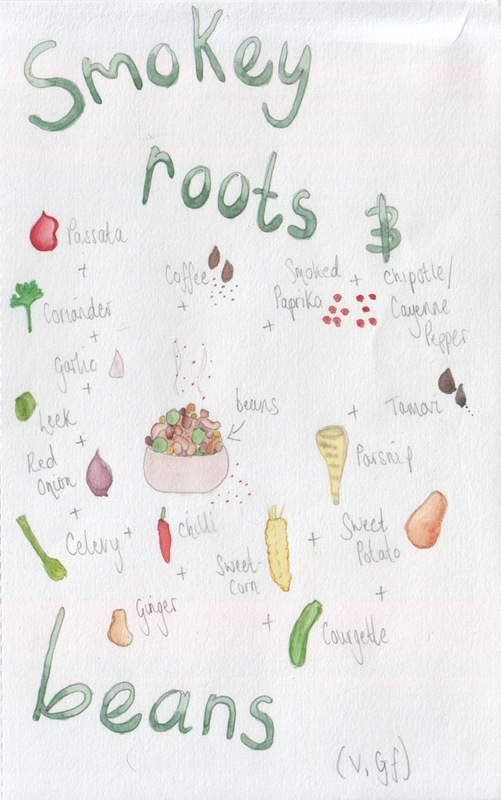 Therefore this dish is good for healing the Solar Plexus Chakra. Good if you need a confidence boost, a little bit more self- esteem or need help feeling in control of your lives. 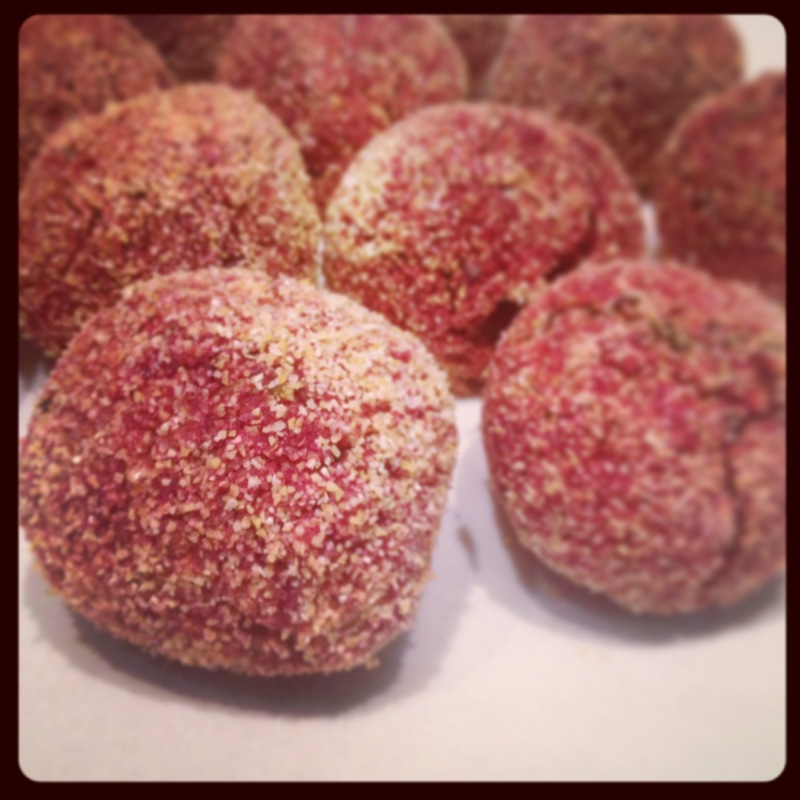 Eat these Falafel- take charge of what is yours. After all, you are the lead role and director of the fantastic film that is your life. Go make it yours!